S.C. Johnson & Son, Inc., is one of the largest family owned and managed companies in the U.S. Throughout the history of the company they have demonstrated innovation, not only in their products but in the way they conduct business. Samuel Curtis was a distributor for the Racine Hardware Company's line of parquet flooring, and in 1886 he bought the flooring business. His customers would often ask about caring for the wooden floor covering; the shellac that was popular at the time was prone to build up and chipping. 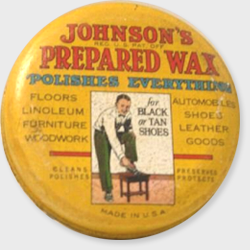 Taking a cue from the centuries old wooden floors of the great houses of Europe that were preserved with wax, Johnson developed Johnson's Prepared Wax. Soon he was selling the product to people who hadn't purchased their flooring from him, and began advertising it nationally in 1888. The company began experimenting with different products such as wood dye, crack filler, and car wax. Due to the popularity of the car wax, the company developed a radiator cleaner. The company would be forced to buy back 900 Model T radiators that were dissolved by the insufficiently tested product. The Wax company learned a valuable lesson from the setback, as top-rated research teams and chemists have been a company priority ever since. Simple maple and oak flooring would replace intricate parquet in the late 1800's, and the company's diversification would pay off as floor wax and other wood care products would exceed Johnson's flooring sales. The manufacture of parquet flooring would be discontinued in 1917. S.C. Johnson & Son would also make strides as an employer. In 1900 they began offering paid vacations and began an employee pension plan in 1934, during the depths of the Great Depression. 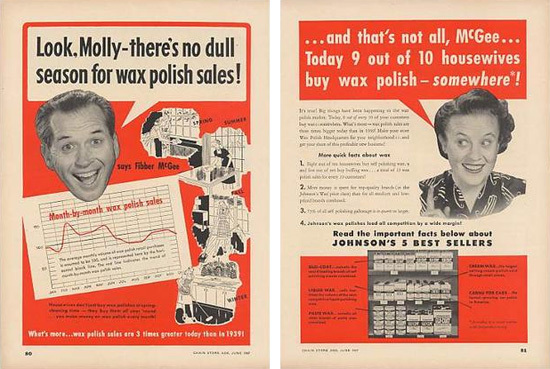 In 1935 H.F. Johnson would lead the Carnauba Expedition, an 15,550 mile flight, during the early days of aviation, to the jungles of Brazil to find a renewable source of carnauba wax for the company. (The trip would be repeated by his son, S.C. Johnson III in 1998, using a replica Sikorsky S-38 amphibious aircraft. It was also in 1935 that the company would begin sponsoring the radio program, The Fibber McGee and Molly Show. Fans of Old Time Radio owe a debt to the company, which preserved recordings of every episode of the show under their sponsorship at their head quarters in Racine, WI. 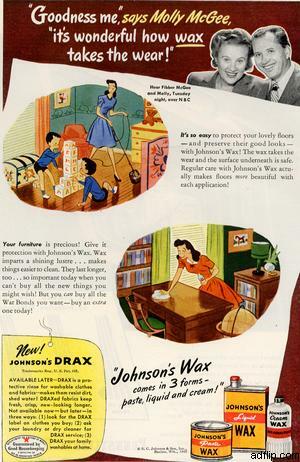 S.C. Johnson products today include Glade Airfreshener, Raid and Baygon Insecticide, Ziploc products, Windex, Scrubbing Bubbles, Saran Wrap, and Pledge Furniture polish.